Picophytoplankton are the main primary producers in oligotrophic oceans. They account for more than 90 % of the phototrophic biomass. Investigations of picophytoplankton in the central Arctic Ocean region are rare because these waters used to be completely covered with sea ice. Large, newly exposed water areas, however, appeared in the sea ice zone during the summer of 2010. This provided the first opportunity to study the Arctic picophytoplankton community in these newly open surface waters. This study focuses on the picophytoplankton in the areas near the Alpha-Mendeleev Ridge and Makarov Basin. Here, HPLC pigment analysis with CHEMTAX was used to study community populations, and 454 pyrosequencing with bioinformatics analysis was used to identify the dominant genera (species). Both Pearson correlation analysis and canonical correlation analysis were used to study the relationships between the community and environmental factors. We found chlorophyll a concentrations were low (0.05–0.39 μg l−1), and picophytoplankton dominated these areas. The abundances of picophytoplankton were 1.58 × 106–9.47 × 106 cells l−1 and made up 44–80 % of the total chlorophyll a. Prasinophytes made up 0–88 % of the picoplanktonic chlorophyll a with the following distributions: diatoms (2–80 %), cyanobacteria (0–20 %), haptophytes (4–14 %), and dinoflagellates (2–11 %). The dominant genera (species) in the picoeukaryotes were Pyramimonas (Pyramimonas gelidicola), Micromonas (Micromonas pusilla), and Phaeocystis. Salinity and latitude were the primary factors controlling the community structure of the picophytoplankton. The online version of this article (doi: 10.1007/s00300-015-1662-7) contains supplementary material, which is available to authorized users. This work was supported by the National Natural Science Foundation (41206189, 41076130), the international cooperation program between the EU and the Chinese Science and Technology Administration (no. 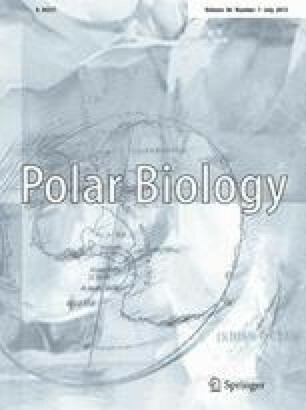 1105), the China International Polar Year Plan, and the Samples Information and Data issued by the Resource-sharing Platform of Polar Samples (http://birds.chinare.org.cn) maintained by the Polar Research Institute of China (PRIC), and the Chinese National Arctic & Antarctic Date Center (CN-NADC).